Grab the pattern piece you made yesterday. There are two ways to lay it out on your fabric for cutting. The first way is to grab your fabric and just lay it right on top. Easy peasy! But, if you are like me, the piece you created may not be identical on both sides. It is pretty important that the pieces to your skirt are uniform. So I suggest folding your pattern piece in half the long way and placing it on the fold of your fabric. This will insure that the skirt piece is perfectly identical on both sides. See my folded pattern piece at the top of the fabric? This photo demonstrates how the pattern piece is on the fold of the fabric. I have placed it on the fold for cutting. Using straight pins, pin your pattern piece to the fabric so that it doesn't move during cutting. In the photo above I have folded the fabric over to demonstrate that it is indeed on the fold. Be sure to fold it back before cutting! Now cut out your pattern piece using sharp scissors. Remove the pins and set your cut piece of fabric aside. Repeat this process so that you have nine cut fabric pieces~ three of each different fabric. Here's what you'll have at the end of Day 2! And yes, I do have 12 pieces here because I got a little crazy and cut a little too many. Depending on your style and body shape you may want 12 pieces. 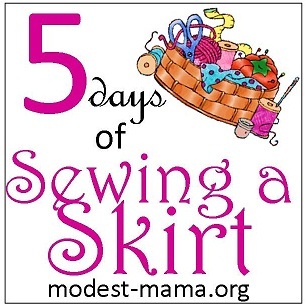 But if you followed the directions for drafting a pattern from Day 1, then nine pieces for this skirt should be plenty. Congratulations on completing Day 2! Check out what other mothers are blogging about here! That is going to be SUCH a pretty skirt! I just love that fabric!